in the mood, but staying out of the forums for a reason. Turns out everyone's on OXCF including @Solarius Scorch are right about my posts being garbage and spammy (which hurted everyone's feelings on there. + the 10-attachment limit sh*t ) compared to my life being a garbaged piece of crap from SPORE-less - to - desktopless impatience crap tmo (to my opinion). Note to @all: this is my first post for today of this month (February), i like to make 2 topics on the Offtopic board, but i decided to put 2 (of them) in 1 instead to make it not spam-ish. don't get me wrong unless i have a right to do so. remember that i'm still fired from OXCF by Solarius last week (jan 26) meaning i have to stay out of the forums until May or November permanently. Before 2 days ago (Jan 26), i've decided to change my username to put a "[TEMPOBANNED]" part at the end due to hurtful, but brutal humiliation from my OXCF workmates excluding Reaver (plus Efrenes, luke83, XOps, and 6 others excluded) including Solarius (don't tell him this) for a reason only ; plus 2 important posts/replies deleted by Meridian in OXCE board (they'll never be remembered at least. ). Therefore; i will be tempobanned (temporarily banned) from the forums (by the GB-MDs of OXCF) until probably May (May 15 2019) or November 2019 to not come back at some point later on. Although, Solarius or everyone (or the OXCF staff) are right about my good(but crappy) posts being senseless garbage (to them); that's okay for my life to happen (due to english / language issues) + help about a openxcom forum theory about reading all of the posts / threads / replies probably containing official XCOM lore; either original or reboot lore exactly (if there's none actually. 樂). Nevertheless, i'm not going to be posting more of my LEGO stuff / pics / shots on my thread involving them, not on anyone else's threads or my threads that are not the one i have to post them on anymore because of a reason purposefully (+ due to irritating spam crap because of the 10 image limit per post boringness exactly. ☹). For now, i'm going to preferably doing work instead of useless crap (i can still read OXCF without me / my account being logged in), like improving my English with books (+ Dictionaries as books) / notepad / etc and other things i have in mind. plus save on getting the XCOM life i have been wanting after this + beating my challenges for all XCOM (OXC / etc) without save scumming til a year that is not 2010s nor 2020s. So I should not neglect TFTD? If you might, a little 50% yes or no even. It's your choice. also waiting for Solarius or Meridian to merge one of my posts/replies on Otto's "Let's Play: WH40k" mod-LP thread to the previous post so i won't get in trouble this time around. Good well everyone! 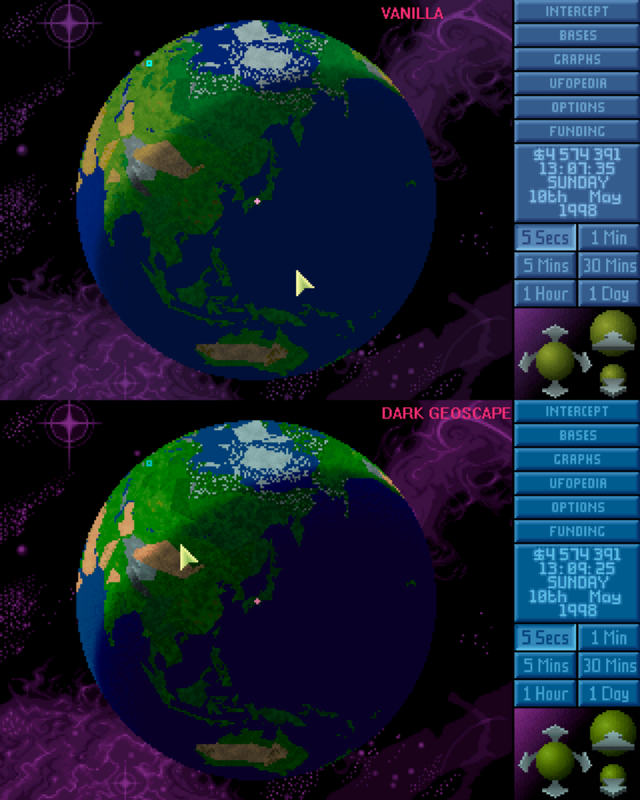 Thanks to this awesome port of UFO Defence, I've come with a splattering of small mods based upon ideas I've had for years since I got that UFO Defence CDROM 20-odd years ago. There's also TFTD iirc since it came to the OXC port added it in 2015, two xcoms (xcom1/UFO94, xcom2/TFTD95), same OXC, same XCOM. The game is switchable in the game's options menu. This is how TFTD (in OXC/OXCE) looks like, just like Meridian's TWOTS LP if i'm right. You always change it to UFO94 (UFO:EU / XCOM:UFOD) if you like. Also, welcome to OXCF since you've joined/registered in/on January 17 2019 (9 days ago). Enjoy your works, private. In future I hope making it into a very modable open source engine, which could be used to implement any similar game, from games like Final Fantasy Tactics like to Dwarf Fortress and Minecraft type games. Aw that's a good one! Man, i wish XCOM:EU2012/EW (not Long War 1) was moddable til 2020s or 2030s instead of 2019/this year. Have fun with your threads and your mod/projects! Turns out; it looks nice and cooler to see an interesting GEO palette. I wanted to continue this weekend, but I got sick. So hopefully next weekend... if I manage to get rid of this stupid flu. Too bad that was 250% super duper impatient and sad that you don't have new TWOTS LP episodes last month along last year 2018. Also: "Last updated on Dec 16, 2018" i believe. Til you get better next month or March without the flu , please a new episode of your LP please cuz i'm missing new episodes more often. Cheers and have a good month then!